(AP) CAIRO - Egypt's Justice Ministry on Wednesday gave the country's military police and intelligence agents the right to arrest civilians over wide range of suspected crimes, including "resisting authorities," sparking charges that the country's military rulers want to extend their grip on power even after handing over to civilians. The decision comes during heightened tensions in Egypt, three days before a highly polarized presidential runoff election and a day before rulings by the country's highest court that could dissolve the Islamist-dominated parliament and even cancel the Saturday-Sunday presidential vote. The decision, published in the official gazette, would remain in effect until a new constitution is in place. The process of writing a constitution has hit snags. On Tuesday the Islamist-dominated parliament voted on an assembly to draft the document, but liberals boycotted the session. An earlier attempt to name the body collapsed because of opposition from liberals. Both times they charged that Islamists were unfairly dominating the procedure. Military analysts said the military arrest powers were a temporary measure intended to fill a security vacuum resulting from last year's uprising, when the police force collapsed and disappeared from the streets during the first days of the mass protests. "The police force has not recovered completely, and security is not back," said Sayyed Hashim, a former military prosecutor, in a TV interview. Rights activists warned the new decision creates a reproduction of notorious emergency laws that expired recently and said that it also could extend the rule of the generals, even if they transfer power to civilians on time by the end of the month. "This is a declaration of martial law, as if we are living in banana republic," said Gamal Eid, a prominent rights lawyer. Egypt's notorious emergency law, which expired on May 31, gave broad powers to detain and arrest for the police, who were accused of abusing their far-reaching authority. 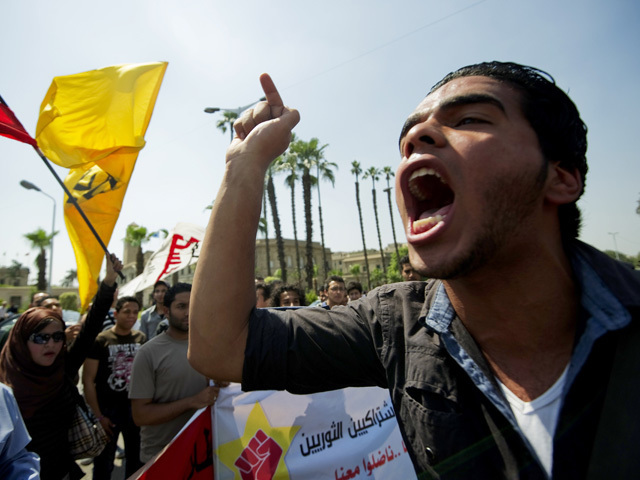 For three decades under President Hosni Mubarak, abuses were rarely punished. At one point, human rights groups said there were more than 10,000 people in detention. Even after the emergency laws lapsed, the generals who took power after Mubarak was deposed in last year's uprising have rounded up protesters, referring them to military tribunals known for swift and harsh rulings. The military has pledged to turn power over to a civilian government once a new president is named. The runoff election for a new president is set for Saturday and Sunday. Even then, the military is intent on protecting its powerful position, including widespread economic interests. Court appeals could upset the timetable. Egypt's highest court could rule this week on a challenge to the presidential election and another seeking to overturn the parliamentary election, which put Islamists in a commanding position.